Interface Computational Science (IFCS) group, Center for Green Research on Energy and Environmental Materials (GREEN), National Institute for Materials Science (NIMS) was originally established in October 2007. The group belongs to MANA and MaDIS-cMI2, NIMS as well. Deep collaboration with leading experimentalists to understand the underlying physics/chemistry. 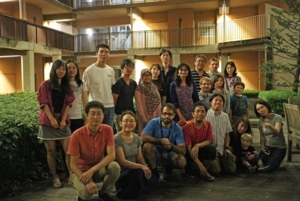 Post-doc positions and ph.D student positions are quite often available in this group. For those who are interested, please refer to the message below and the advertisement page. Prof. Michiel Sprik (Univ. Cambridge) visited the IFCS Gr. (11/04/19). A. Ishikawa, Y. Tateyama, J. Comput. Chem., (2019). T. A. Ivandini, S. Iizuka, Y. Tateyama, Y. Einaga et al., J. Phys. Chem. C (2019). M. H. N. Assadi, Y. Tateyama et al., J. Electrochem. Soc. (2019). Y. Okuno, G. Shukri, Y. Tateyama et al., J. Phys. Chem. C (2019). 館山佳尚, J. Comput. Chem. Jpn (2019). L. Szabova, Y. Tateyama, S. Fabris et al., J. Phys. Chem. C (2018). M. Hattori, A. Choudhary, Y. Tateyama, Y. Uchimoto et al., J. Phys. Chem. C (2018). K. Sodeyama, Y. Tateyama, M. Okada et al., Phys. Chem. Chem. Phys. (2018). A. Ishikawa, Y. Tateyama, J. Phys. Chem. C (2018). R. Jalem, et al., Sci. Rep. 8, 5845 (2018). Dr. S. Iizuka and Dr. G. Shukri gave contributed talks in 2018 MRS FALL Meeting (Boston, MA, USA). Message: For those who have interest in working or learning in the IFCS Gr / Tateyama groups. We believe that “motivation, patience, objectivity, flexibility, cooperativeness” is important for doing cutting-edge researches. Proving a new concept often takes a long time, so that we need “patience & strong motivation”. “Objectivity” is necessary to extract new features from a lot of data, As concept change and/or additional calculations are often needed, “flexibility” is also essential. Through the cooperative discussions with the other scientists, you will be able to understand the phenomena and the underlying theory deeply.